Welcome to The Soudan, the ‘land of the blacks.’ The present-day country of Sudan, while still massive, is only a fraction of the area that was referred to as The Soudan in centuries past. The name was a catch-all phrase for lands south of the Sahara that harbored black Africans. It also denoted a change in landscape, with the sands of the desert giving way to the savannahs in the south. I traveled through northern Sudan just before another milestone in this region’s history, that of secession of its southern region into the new country of South Sudan. The region of ‘Sudan’ has had a very tumultuous history since recorded inhabitation began in 8,000 BC. The harsh climate and resource-rich land has allowed it to be influenced by outside forces throughout its history. It was a part of Egypt in various times of the past and being close to Arabia, Islamization happened early. 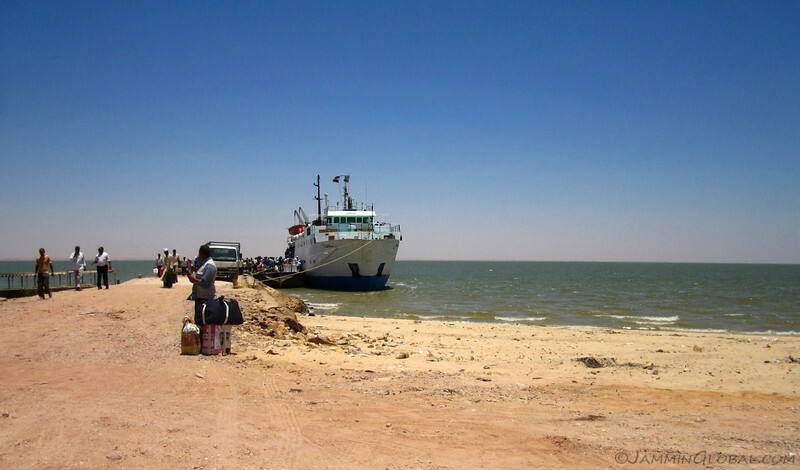 In more recent times, controlling access to the Nile drove European colonial powers into Sudan, who bear some responsibility for the current state of the region. Even while Sudan happens to be in the world’s consciousness for all the wrong reasons, such as conflicts in Darfur and Abyei and its authoritarian president, Omar al-Bashir, the people of Sudan were one of the nicest that I have encountered on this journey, so far. 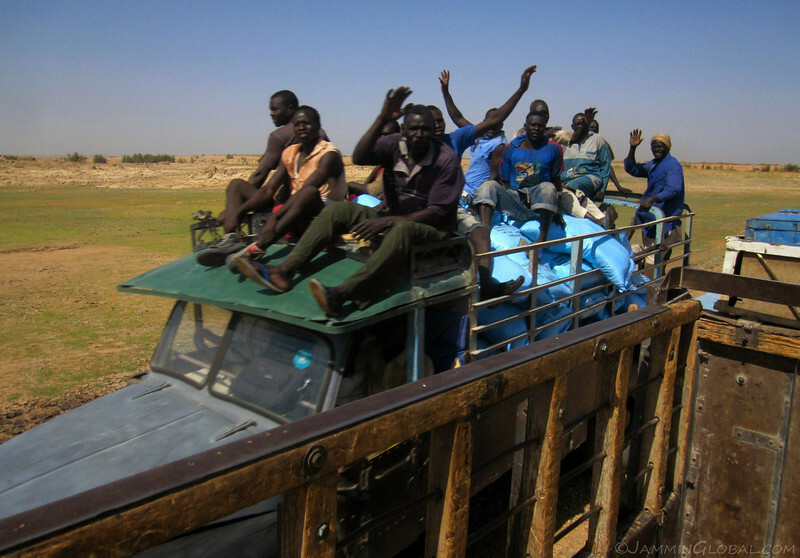 I felt extremely safe through my travels in northern Sudan and was welcomed warmly by all its people. It’s too bad the news doesn’t report on all the regular, good people of the world. 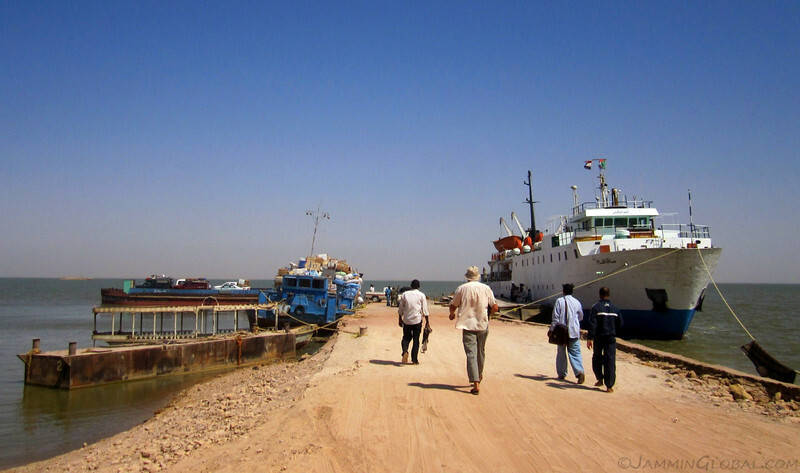 This first photostory documents my entrance into Sudan at Wadi Halfa, a port town on the southern reaches of Lake Nubia (Lake Nasser in Egypt). The mad scramble to disembark from the overnight ferry from Aswan. 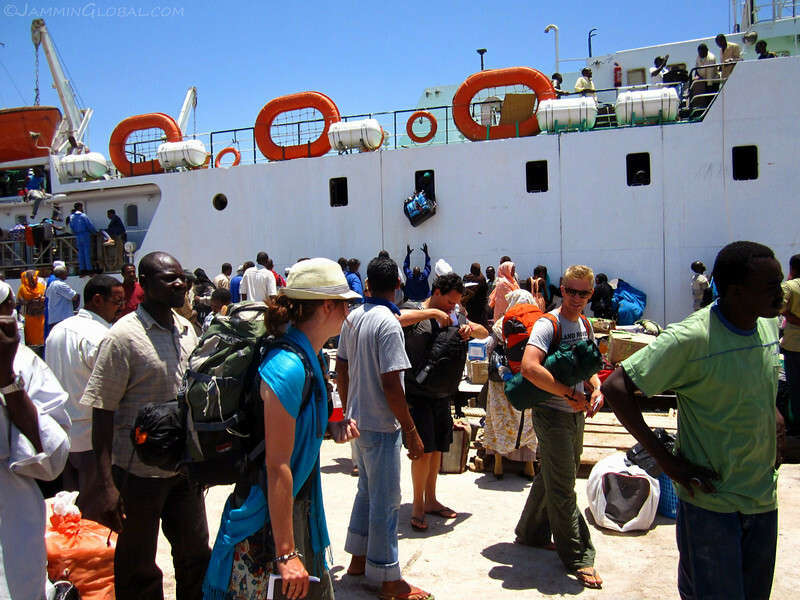 It was all calm on the ship, but as soon as the doors opened, it was a rush to get out and get processed into Sudan. Before we could leave the ship, an immigration officer came on board and interviewed all the ‘foreigners’ before issuing us a travel permit so that we could move about independently. 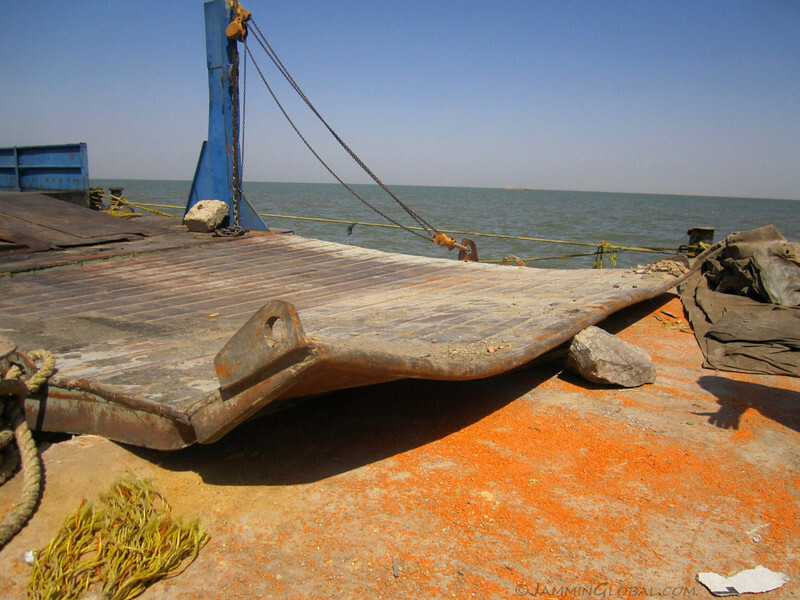 The Sagalnaam, our wonderful ride across Lake Nasser from Egypt into Lake Nubia in Sudan. It was close to noon and the temperature was rising past 50 C (122 F). From the pier, we had to board a bus to take us to the Customs and Immigration building. There were about 300 people who arrived on the ship and not enough buses, so a lot of pushing and shoving ensued. This is Ben, traveling overland in a Toyota Hilux with his friend, Edward. 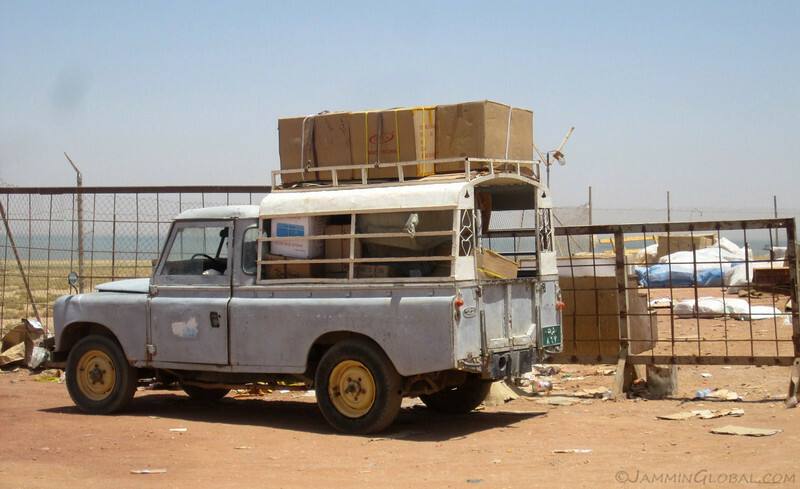 After having our luggage scanned through customs and passports stamped, our group got into an old Land Rover Defender that served as a taxi for the short 5 km ride into town. 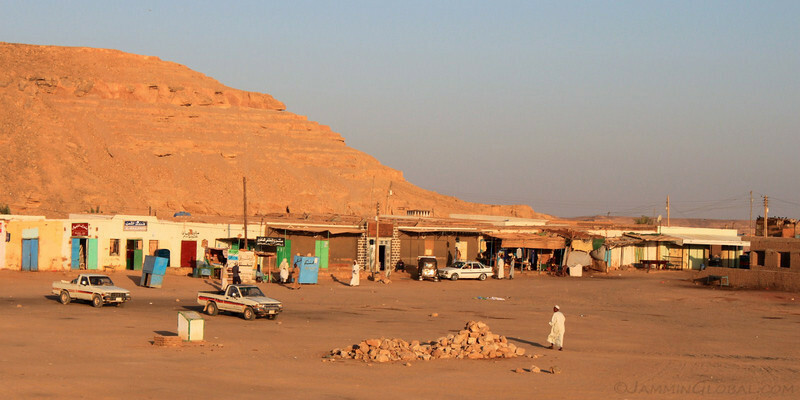 The town of Wadi Halfa, or actually New Halfa, because the original Wadi Halfa got submerged when the Aswan Dam was built. 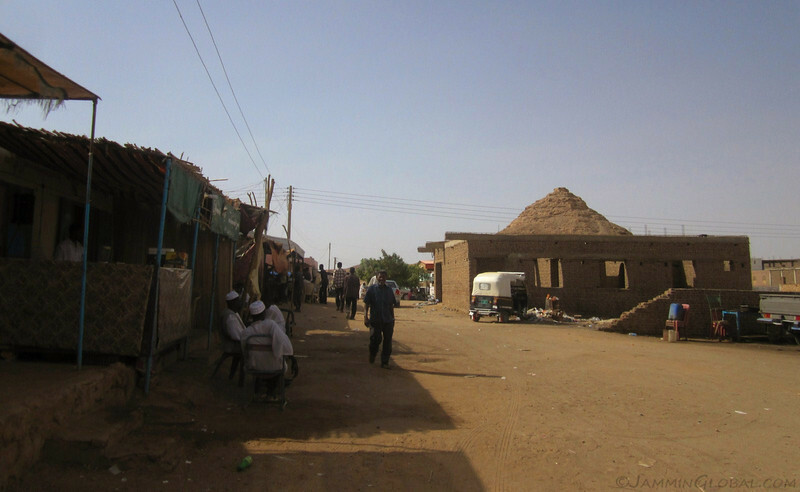 Under pressure from Egypt, the Sudanese government in the 1960s forcibly moved the residents of the old town to this new location and built them a small dam to encourage them to resettle and get into agriculture. Well, that all dried up and the current town is a ghost of its former self. Having our first meal of the day after getting into town and right away we encountered the niceness of the Sudanese people that we were told about by other travelers. This restaurant owner went out of his way to procure different foods for everyone in our group as we slowly got used to the intensity of the heat. 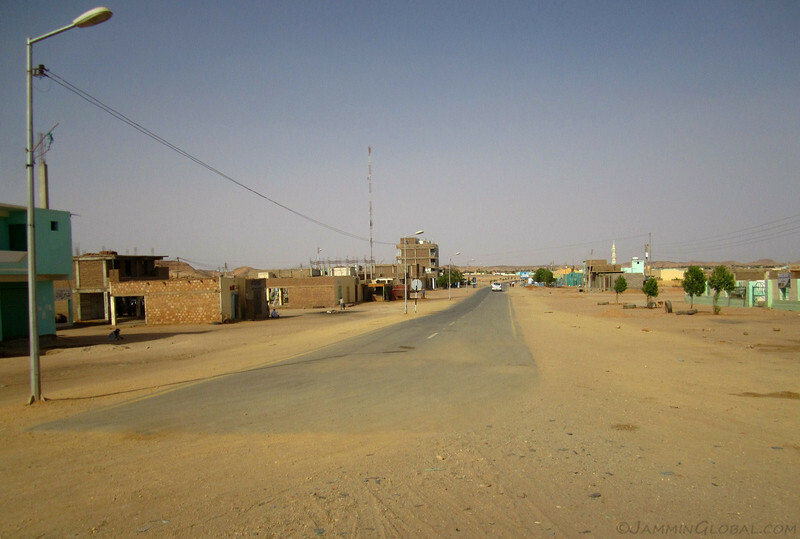 The quiet streets of Wadi Halfa, where nothing much happens during the heat of the day. 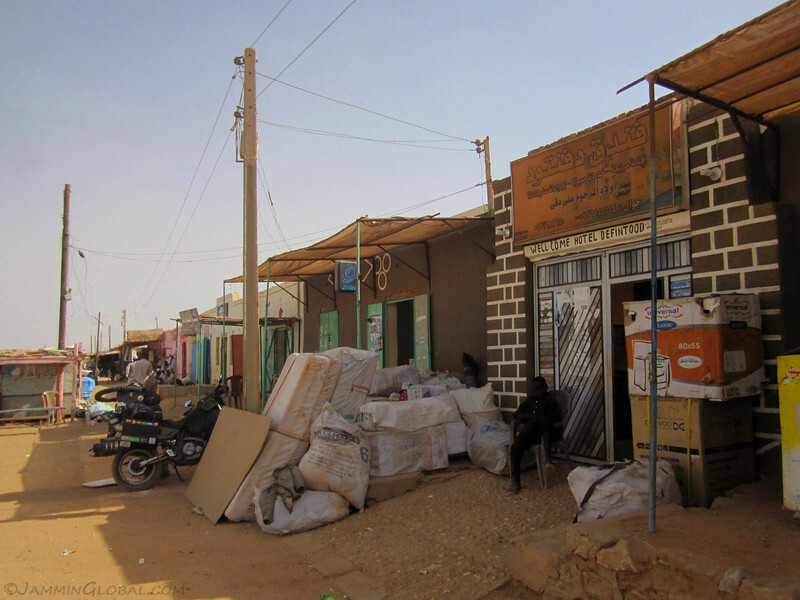 Most of the buildings were made of mud bricks, that have to get redone after the rains and the streets were sandy, choking the area when a strong breeze came through. 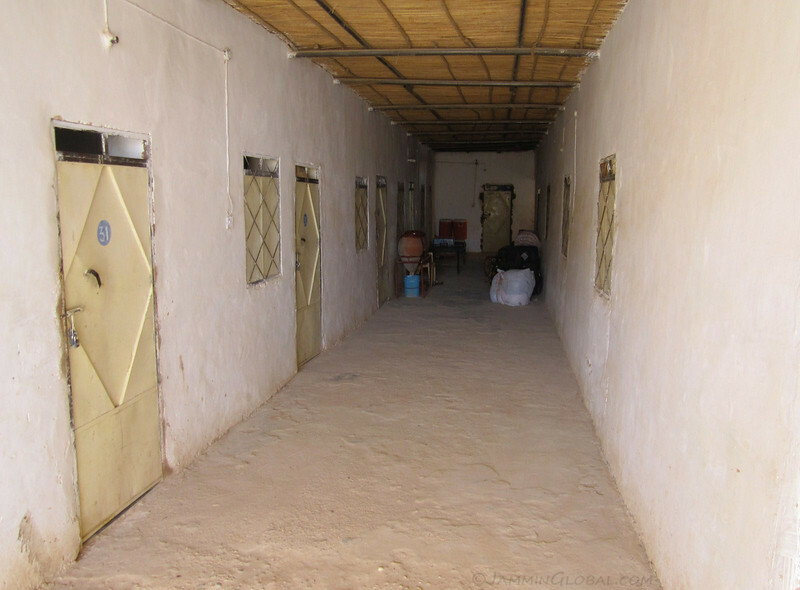 Desert lodging in Wadi Halfa at The Defintood Hotel, for 7 Sudanese Pounds ($3.20) per night. There was a fan that blew hot air down and cool drinking water in clay pots. 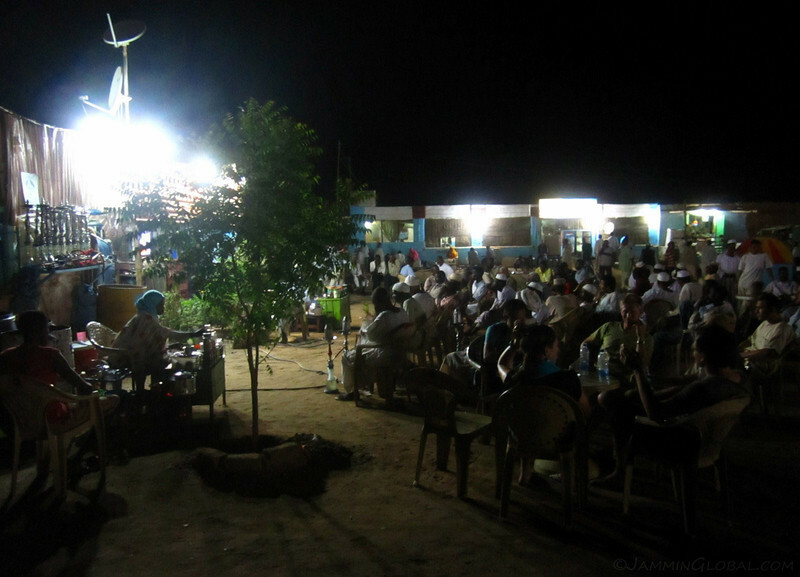 The town came to life after the sun went down and we gathered in the central square where the locals were focused on a football match being broadcast. All the businesses in the square were decentralized, meaning that you got tea from one stall, then falafel from another stall and shisha from another. Ed pointed this out and said if this was some square in Europe, there would be one boss who would be controlling all the services in this area, ensuring efficient delivery and making big profits. But, thankfully, this is not Europe and things happen on a much slower, relaxed rhythm where everyone can run their own business at their own pace. Our beautiful Nubian tea lady for the evening. Being a Muslim country, and one that Sharia Law is enforced in, alcohol sale is banned, so everyone drinks tea. 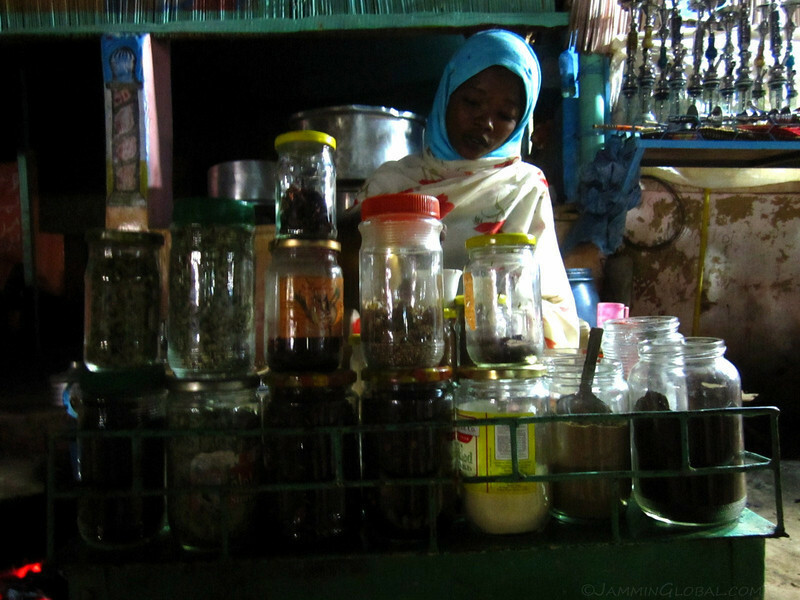 And they make some fantastic tea in Sudan; check out all the various herbs she had. I enjoyed her spiced tea with cummin. Northern Sudan is the land of Nubia, with the distinct feature of beautiful round faces of its people. 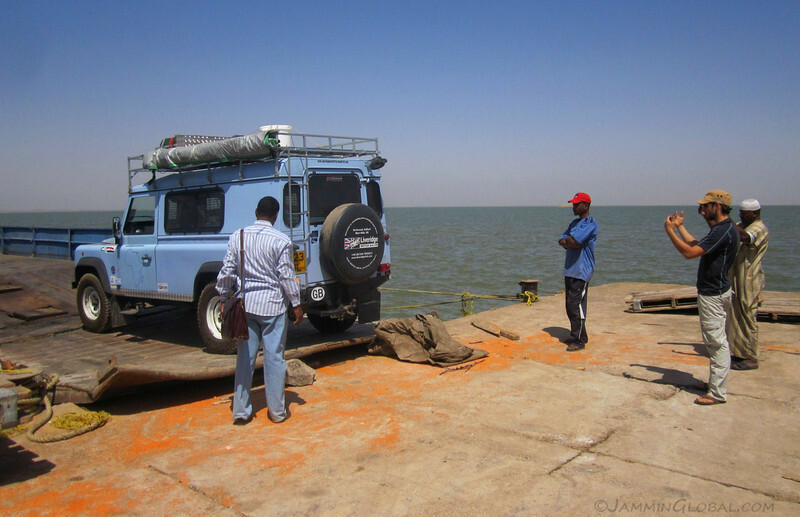 The next morning, we were alerted that the barge carrying our vehicles had arrived at the port. It usually takes 2 or 3 days, so we were all pleasantly surprised that things were moving quickly. We hailed a Defender taxi to get us to port. 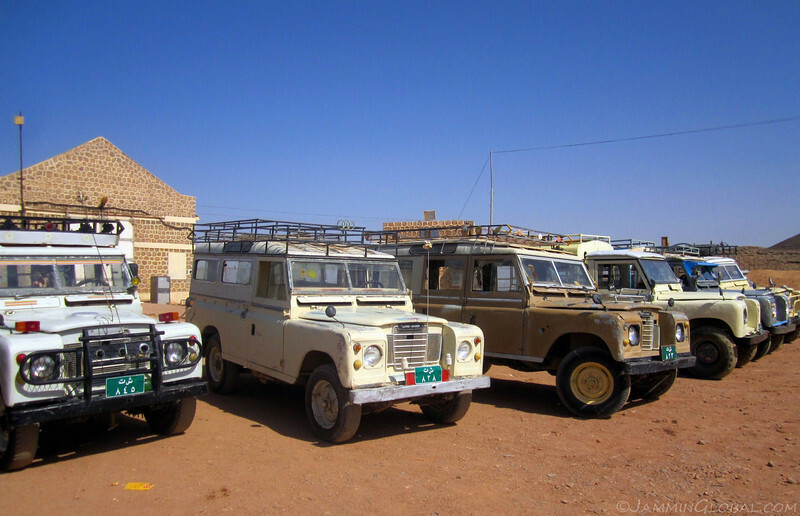 Just like how Bahariya in Egypt was the land of Toyota Land Cruisers, Wadi Halfa is the place that old Defenders go to have a second or third lease on life. The road to the port is paved and straight; yet, our driver was wildly swinging the steering wheel to keep the old Defender tracking straight ahead. Poor thing could use some new bushings. Once in the port complex, we boarded a big truck to take us to the pier. A bunch of friendly Sudanese dock workers riding past with a truck loaded up with fresh cargo from Egypt. Back at the pier and we were all happy to see the vehicle barge docked across the Sagalnaam. A big dent in the ramp from the barge. The pier is higher here than the one in Aswan, so off-loading was a bit trickier than getting on. I found that slanted rock nearby and placed it as a ramp for the bike and the other vehicles. Guy, backing up his Defender under Ed’s guidance. 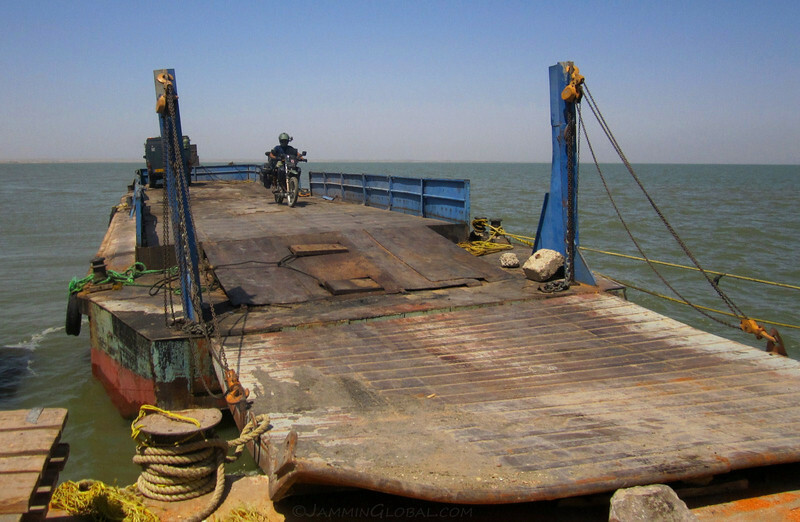 Riding sanDRina off the barge and onto Sudan. I was glad to note that the bike hadn’t moved at all during the voyage. On the ground in Sudan and waiting to process through customs. We handed our carnets over to Magdi, the local fixer in Wadi Halfa, who has a good reputation among the overlanding community. 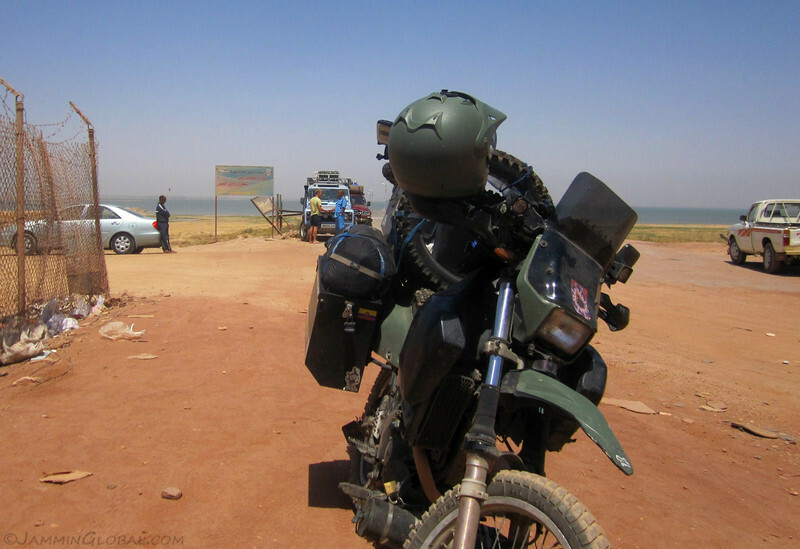 With a customs fee of SP 100 ($45), he got all the required stamps done and after having our VIN numbers verified, we were free to ride into Sudan. 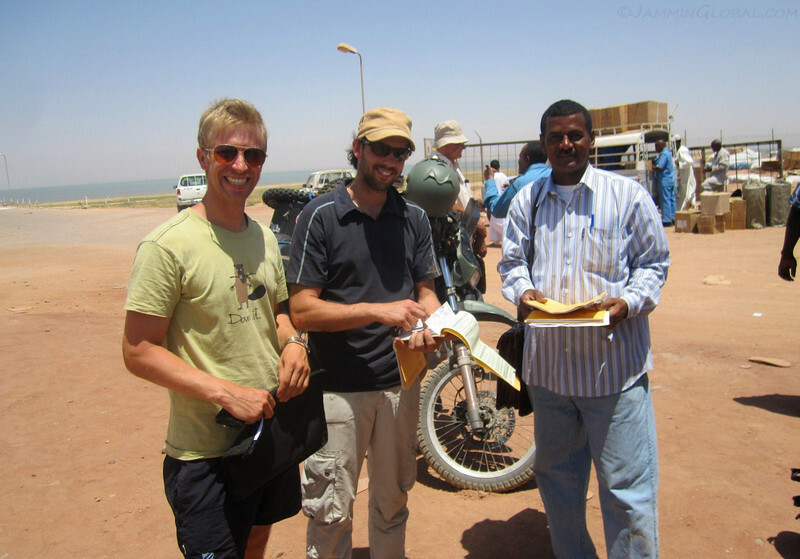 But, there was one last piece of paperwork before we could leave Wadi Halfa. Upon entering Sudan, all foreigners are required to ‘register’ their passports within 72 hours of entering the country and that costs $40. We paid Magdi $15 for helping us out and after tipping the barge captain $5, the total cost for entering Sudan, including the $100 visa comes up to a whopping $190. Just like Egypt, it’s expensive to enter, but once inside, it’s cheap. A Defender, loaded up with cargo from the port, heading into town, which comes alive the two days after the ferry docks. Stocks are replenished and trade thrives, until the next ferry landing. Cargo from Egypt piled up outside my hotel before it gets taken further south into Sudan. 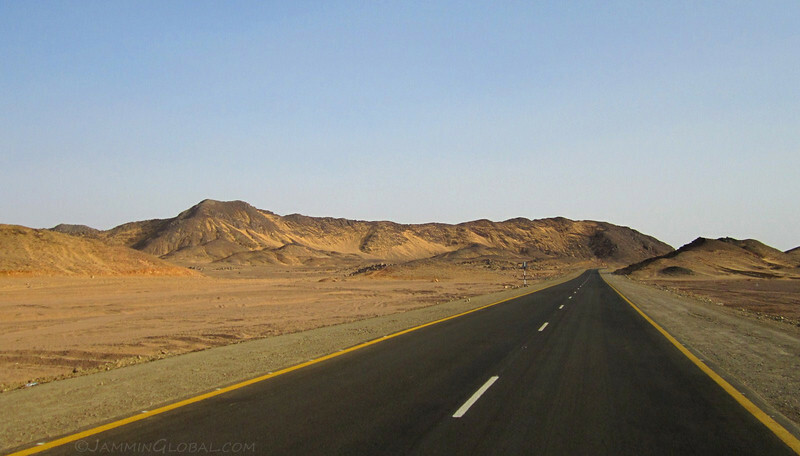 The start of the highway to Khartoum from Wadi Halfa. 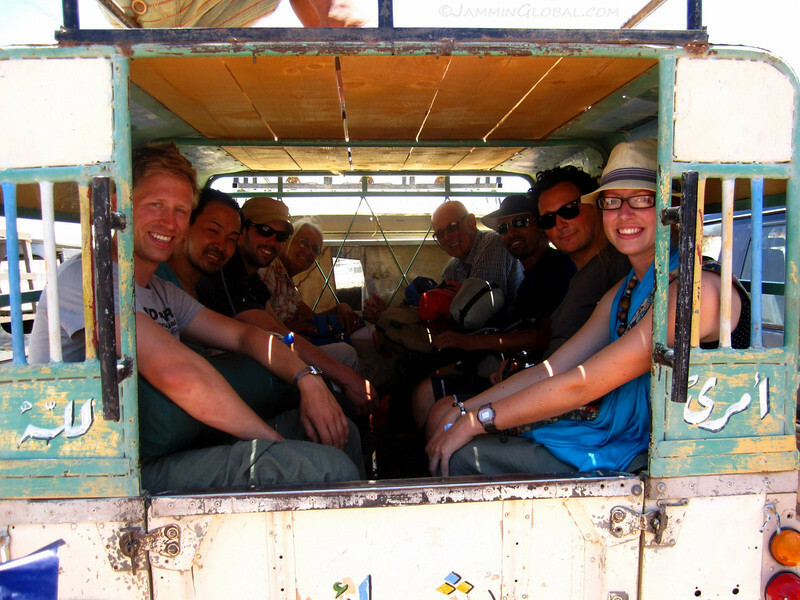 I bid goodbye to my fellow travelers, as I stayed an extra night in Wadi Halfa. 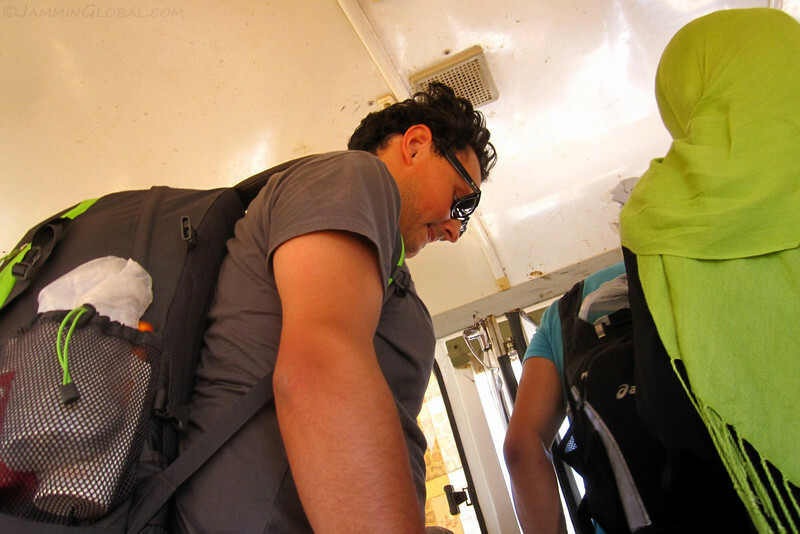 I left Wadi Halfa in the late afternoon, to beat the heat and headed south to meet the Nile. All 900 plus kms (560 mi) to the capital have been paved in the past few years, taking some of the riding excitement away and making the journey a bit easier. My route through northern Sudan, entering at Wadi Halfa and then following the Nile on its course from Khartoum and exiting in the south east into Ethiopia. The time zone changes as Sudan follows East African Time (+3 GMT). Click on it to go to the interactive version in Google Maps. Past overlanders have regaled about the grueling ride through the deserts of Sudan, which nowadays are a thing of the past thanks to the Chinese who have delivered on their promise to improve infrastructure in exchange for oil and mineral resource rights. 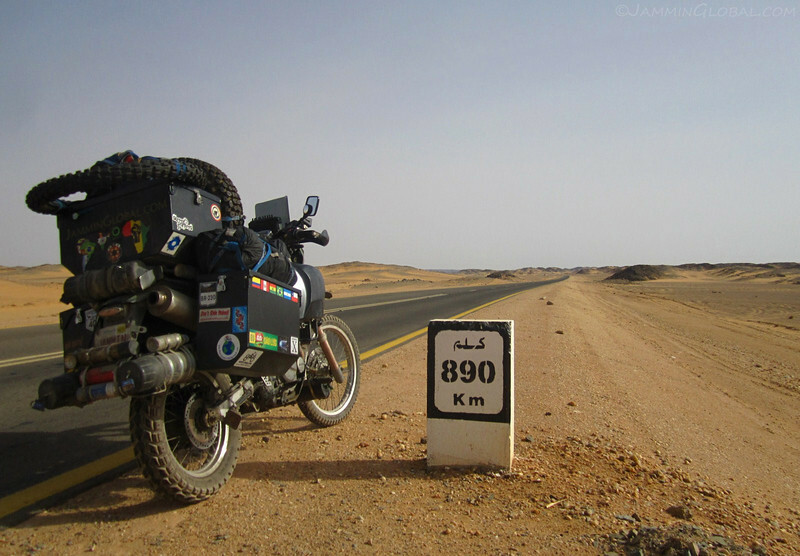 It’s high time to ride the world, before it gets all paved over by the Chinese! Curves in the desert, as I approached the Nile. 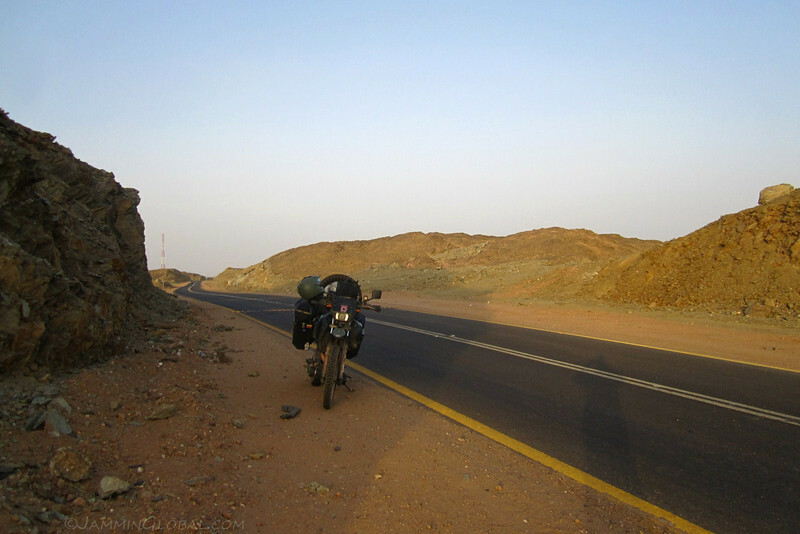 Riding into the sunset as I searched for a place to camp for the night in the deserts along the Sudanese Nile. 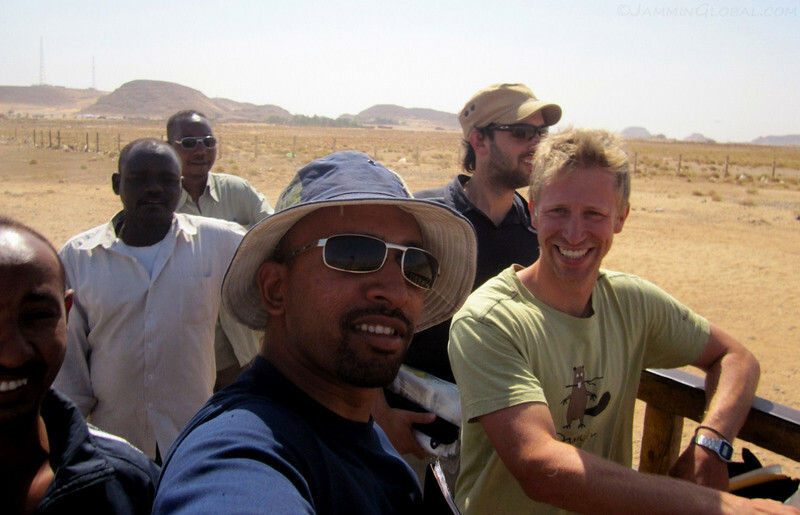 With a good introduction to Sudan, I was excited for the journey through this unknown land to me. Going with the flow, in the next photostory, I encountered some fishermen on the Nile who took me in for a few days and showed me a slice of their Nubian life. 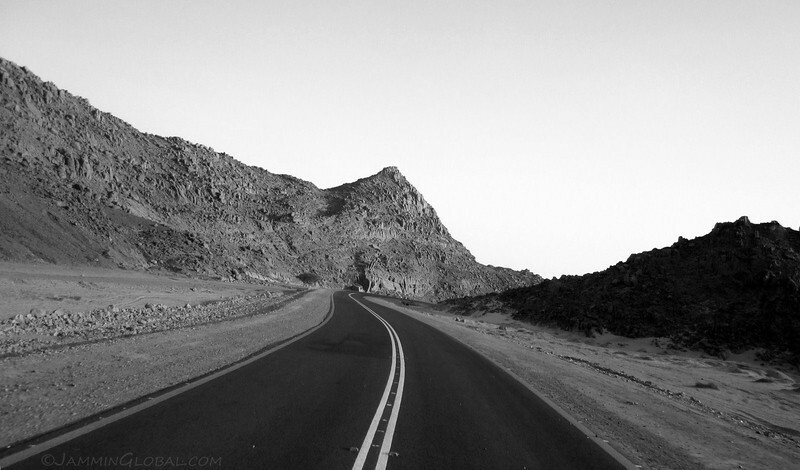 Amazing pics dude..It seems your are so damn creative..
Hey Marcin, wow, cycling thru Sudan must be quite a challenge. Nice now that they have tar roads but the heat is something else, eh? Nice photos.